Since becoming officially gluten-free, I’ve been pretty much living on quinoa. I keep a tub of it pre-cooked in my fridge, and am now trying to find ways of disguising it for lunch so that I don’t go crazy from boredom. Luckily, it’s a very versatile grain, and there have been many experiments to-date. 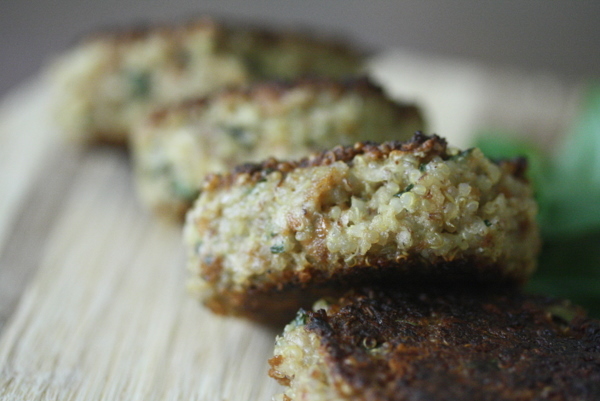 My favorite thus far are these quinoa cakes, which taste good room temperature or hot, and keep just as well pre-made in the fridge as the leftover quinoa itself. This particular version is kind of a deconstructed pesto. Instead of mixing all the elements together in a food processor to form a paste, each classic pesto ingredient–nuts, parmesan cheese, basil, and garlic–gets finely chopped or pulverized (see recipe headnote) individually and mixed in with the quinoa. The result is much more subtle, and the flavor of the ground nuts helps bring out the nuttiness of the quinoa grains itself once toasted in the skillet. When it comes to brown bag lunch dishes, we take into consideration portability, the re-purposing of leftovers, and the ability to be made ahead or quickly the morning of. These cakes fit the bill completely. If you omit the eggs, the quinoa mixture can keep in the fridge for up to a week. You can cook the cakes the night before or in the morning before work, then reheat at the office. Almost every ingredient, aside from the basil, is pantry-friendly, so this is a recipe that will always be within your reach. Or, if you’re one of those new apartment dwellers just getting your pantry going, you won’t be disappointed by buying these ingredients for your lunch, and holding onto the excess in your cabinets for the months to come. Phoebe is the co-founder of Small Kitchen College and Big Girls, Small Kitchen. I just made these for the first time, and they were absolutely delicious. Thanks so much. I doubled the recipe and made enough for one dinner for two, and a few lunches. Great recipe!